BURNS, Ore. -- A metal detector and four sheriff's deputies stood in the doorway yesterday of the Harney County Courthouse, a rare sight in this quiet ranching town that has gained an international spotlight after a dozen or so armed men seized the headquarters of the nearby Malheur National Wildlife Refuge. "It's not the norm here," said County Judge Steven Grasty, Harney's highest elected official. He's only seen metal detectors at the courthouse doors one other time in the past four decades. Residents of this sparsely populated county of 7,000 may sympathize with the militants' views on federal government overreach. But they want the occupiers -- led by Nevada rancher Cliven Bundy's sons Ammon and Ryan -- to go home so life can return to normal. Schools and federal offices including those of the Bureau of Land Management, Forest Service, and Fish and Wildlife Service remained closed yesterday out of caution. Mail service was halted Saturday when hundreds of activists, many of them from out of town, rallied in the streets against the five-year imprisonment of local father-and-son ranchers who were convicted of setting fires on BLM lands. Amid heavy snow yesterday, squad cars from state, county and tribal police forces cycled in and out of a makeshift command center guarded by police tape and blockades. Hotel rooms that normally sit vacant in winter months are booked solid, full of out-of-town reporters and police officers. Grasty, whose extended workday was evident from the half-eaten box of sprinkled doughnuts on his desk, said he's logged 750 minutes on his cellphone and about 250 texts since Monday. He sent Ammon Bundy an email Monday asking that he pack up and leave but received roughly 100 "F you" emails back, he said. Judge Steven Grasty said Harney County residents are frustrated, but not fearful, of the armed occupation of the Malheur refuge. Photo by Phil Taylor. "Go back to your families," Grasty said. "We're all right. We'll figure this out. We're not fearful, and we do not want him speaking for us." Residents of Burns and adjacent Hines, sister towns that are 75 miles from the nearest other settlements, reflected that sentiment. The militants have been called "nuts" by more than a few. While the occupiers appear to be heavily armed, few in town are taking them very seriously. "It's a very frontier town here," said John Lamborn, a defense attorney whose office is located across the street from the police command center. "Upwards of 90 percent of the people here own guns and believe in Second Amendment rights." Harney County Sheriff Dave Ward said yesterday that he will host a community meeting this afternoon at the fairgrounds to discuss "safety concerns and the disruptions caused by the behavior of those" at the refuge. 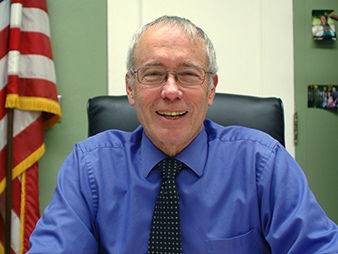 "It is very important that Harney County citizens who feel strongly about getting these militants out of our county join with me in this effort," he said in a statement. Steve Riley, 66, who owns MoonRise Books on Broadway Avenue, said he, like many here, believes the sentence handed down to ranchers Dwight and Steven Hammond was too harsh, but he's not defending the Hammonds, either. The family has a checkered past of alleged poaching, arson and child abuse. 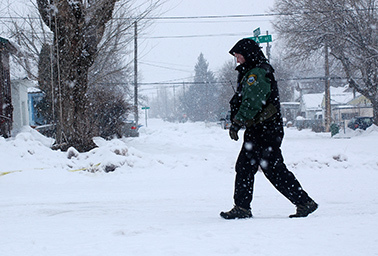 A sheriff’s deputy patrols the street outside of a makeshift command center in Burns. Photo by Phil Taylor. "A lot of people in this town have checkered pasts," he said. "It's why we live here. It is the last vestige of the Wild West." A press release issued by the county yesterday called the Hammonds a "well respected" family. Riley said businesses were advised to close down Saturday amid fears of riots, but he kept his open. He placed an American flag outside his storefront, hoping to tap into the patriotic fervor and sell more books. There's sympathy for the Hammonds and, to a lesser extent, the militants at Malheur. Many residents agreed environmental laws are fettering access to public lands. BLM, which manages nearly 4 million acres in Harney, roughly 60 percent of its landmass, recently passed new sage grouse plans that many ranchers and miners feel are overly restrictive. A Dec. 14 meeting in Burns to discuss the agency's plan to withdraw 10 million acres from future mining claims, much of it in southern Harney, was postponed. Ammon Bundy was in town at the time attempting to recruit followers. Bundy's solution -- turn over federal lands to states -- resonates here, even if many believe it's legally flawed and impractical. Tonight, after the sheriff's community meeting, Nevada rancher Cliff Gardner is scheduled to give a presentation on constitutional issues at the Chamber of Commerce building. Gardner, who has argued that the federal government has no rights to the lands where his cattle have grazed, has been twice convicted of trespassing on federal lands. Thomas O'Toole, who ranches cattle in Drewsey, Ore., said he agrees with the Bundys' principles but not their tactics. He and his father paid a visit to the militants at the refuge yesterday. Members of the public, but not all media, were free to come and go as they please. "I agree we do need to reutilize the land by the ranchers," he said, noting that his and his father's cow-calf business gets along with BLM "just fine." Most Western ranchers graze their cattle on BLM or Forest Service lands during some part of the year. "We believe ranchers are the most adamant environmentalists," he said. "We're the ones who actually use the land; we're the ones who gain our livelihood from the land." Brandon Baron, 37, of Burns, who runs a tree service for area ranchers, said ranchers and loggers have gotten squeezed out. "We've compromised ourselves out of our natural resources," he said. "They take public comment. They don't do anything about it." 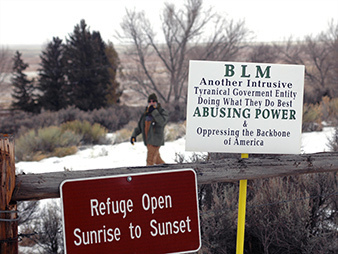 Signs blast a “tyrannical” BLM at the refuge, which is managed by the Fish and Wildlife Service. Photo by Phil Taylor. Local frustration mainly targets the BLM headquarters in Washington, D.C., which many believe is forcing local employees to advance a political agenda. "If there's anyplace where I agree with Bundy, it's that there's too much regulation and it's too complicated," said Grasty, the county judge. He said he has no appetite for Bundy's vision of taking ownership of federal lands. About four years ago, ranchers, environmentalists and elected officials got together to rewrite the 188,000-acre refuge's management plan, hoping to increase grazing, improve bird habitat and reduce invasive carp, Grasty said. There's a shared hatred of government regulations, but diverse stakeholders are committed to finding amenable solutions, he said. Moreover, the county would be bankrupt if it inherited the roughly 4.6 million acres of federally owned land, Grasty said. A single wildfire may burn up $20 million in county funds. "I like the fact that this [land] belongs to all of us," he said. "I like the fact that cattlemen can make a living off of it. I like the fact that I can hunt on it." The natural resources that the Bundys claim are being locked up by the federal government are central to Harney's identity. Gold was discovered in eastern Oregon in the 1860s, bringing thousands of prospectors and violent skirmishes with Native Americans. Cattle ranchers were also attracted by the abundant bunchgrasses and proximity of railroads. The pine wood used for the courtroom judge's bench, jury box and spectator benches was furnished by a local firm, the Edward Hines Lumber Co., and a painting of a cattle roundup hangs about the judge's bench, according to the book "Exploring Oregon's Historic Courthouses" by Kathleen Wiederhold. An elk trophy hangs on the opposite wall -- the animal was used as evidence in a poaching case that implicated several hunters. The county claims to have over 500 farms and ranches, some dating back five generations. Local schools close down for two days each fall to celebrate the Harney County Fair, Rodeo and Race Meet. Tourism -- bird-watching in particular -- is also a big draw, and business owners do not want the town's name sullied if a deadly confrontation erupts at Malheur like the shootouts involving federal agents at Ruby Ridge, Idaho, and Waco, Texas. Local residents value the refuge, whose lakes and marshes attract thousands of sandhill cranes, ibises and pelicans and which is a key stopover on the Pacific Flyway. The annual springtime Harney County Migratory Bird Festival is an economic spark plug. "People won't come if there are armed insurgents," said Lamborn, the defense attorney. He, like others, hopes authorities will take action to flush the militants from the refuge, including by shutting off the power and blocking off their supply routes. "Let these guys enjoy the winter majesty out here," he said, alluding to the nighttime temperatures that often drop below zero. "Without resupply, I think these guys will walk out on their own. Otherwise, they're the Donner Party and they're going to start chewing each other's legs off."